A ruinous battle for supremacy in the Asia-Pacific has begun that could see the region divided and ASEAN itself marginalized. At the Shangri-La Dialogue in Singapore earlier this month, US Defence Secretary Leon Panetta announced that the US plans to shift 60% of its naval assets to the Pacific theatre by 2020 as part of President Obama’s policy of “pivoting back” to the Pacific. In line with this, six out of the eleven US aircraft carrier groups and the majority of the US Navy’s cruisers, destroyers, littoral combat ships, submarines and the very best of US missile defence technology would be redeployed to the Pacific. Already Washington is moving to regain access to its former bases and other operational facilities in places like Subic Bay and Clark Field in the Philippines, Cam Ranh Bay and Danang in Vietnam, and U-Tapao Naval Airfield in Thailand. At the same time, US-led military and naval exercises like Cobra Gold, which this year included Indonesian, Japanese, Malaysian, Singaporean and South Korean military forces, are being expanded. These moves appear to be part of a wider strategy that seeks to draw together the ASEAN countries, Japan, Korea, Australia and New Zealand into a network of interconnected political, economic and military partnerships under US leadership. While the US has repeatedly emphasized that the new policy is not aimed at China, no one, least of all the Chinese, believe it. The US is clearly worried about the long-term threat posed by a rapidly rising China and is working to quickly put in place a new and ambitious containment infrastructure. As well, the possibility of vast new oil and gas deposits in disputed waters in the South China Sea gives the region an added strategic dimension that was not there before. China’s military is indeed growing exponentially as a result of double-digit increases in military spending over the past twenty years. The Chinese defence budget for 2012 is estimated at over USD105 billion though many experts believe the figure is much higher. It is, however, still small compared to the US which spends more than USD 700 billion (2011) on defence. For the most part, China’s defence spending is aimed at simply playing catch up and should come as no surprise. However, China is still something of an enigma; its neighbours just don’t know with any certainty how China will behave when it acquires the capacity to project its power well beyond its shores. Its handling, thus far, of territorial disputes with its neighbours has not exactly inspired confidence either. China clearly does not appear to appreciate just how much this uncertainty fuels nervousness and unease within the region. And neither does it appear to understand that small countries on the peripheries of a big power will always see the need for some kind of fire insurance. ASEAN, for its part, has always been comfortable with a strong US presence in the region but it might be getting more than it bargained for this time around. For one thing, the new and more aggressive US approach will leave little room for fence-sitters; sooner or later, the ASEAN countries will have to make hard choices. Indeed, some choices are already being made. Malaysia has hailed the US shift as a stabilizing factor, Singapore has agreed to host additional American warships, Vietnam is moving to grant the US regular port access, and the Philippines is giddy with excitement over the prospect of the Americans returning to Subic and Clark. Perhaps ASEAN is trying to have its cake and eat it too: develop close relations with Beijing at the bilateral level while ganging up on Beijing at the regional level. The Chinese are unlikely to play along. Whatever else might be said of former strongmen like Dr. Mahathir Mohammad, they had both the chutzpah and the guile to play off the big powers against each other; the same cannot be said of most ASEAN leaders today. The other casualty could well be APEC itself. The Trans-Pacific Partnership now being promoted by the US as part of its new Asia-Pacific architecture will invariably undermine the efficacy of APEC. APEC will, of course, linger on but the substance would have been sucked out of it. Even ASEAN could be subsumed and reduced to a mere bit player. The most ruinous consequence of this latest contest for supremacy in the region, however, is that it is bound to drag ASEAN into an arms race it can ill afford. American defence strategy, after all, demands not just common approaches amongst its allies but common and preferably US- made weapons systems as well. With the wars in Iraq and Afghanistan over, America’s military industrial complex needs a new bogeyman to keep its arms industry humming. Africa is too poor, Europe is caught up in a crisis of its own and the Middle East is already maxed out. That leaves the Asia-Pacific region ripe for the plucking. 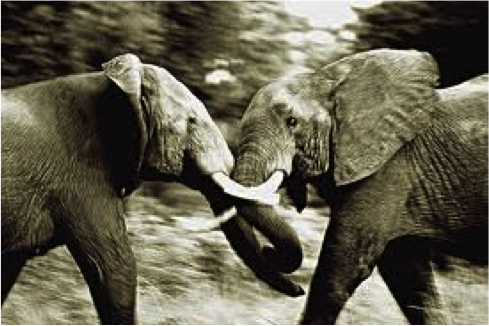 There’s an old saying that when elephants fight, it is the grass that suffers. If ASEAN, which evolved specifically to manage big-power rivalry in the region, is not careful, it could soon find itself squeezed on all fronts.